This is the day before a New Moon, and with any Balsamic Moon, it’s most appropriate to close up projects or simply reflect and rest rather than begin totally new endeavors. A Mars-Jupiter square today can really rev us up, possibly convincing us that we can do more or take on more than is possible. There can be “much ado about nothing”. New ideas can be considered, but launches or commitments should wait. Watch for haughtiness. A Venus-Juno aspect today can really help to soften rough edges or at least bring some diplomacy to challenging situations. 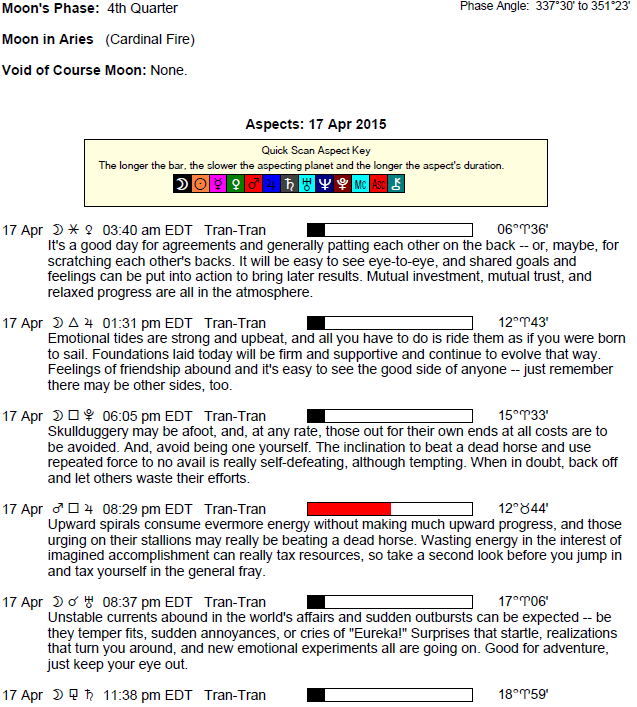 The Moon is in Aries all day (until Saturday, April 18th at 5:31 PM). The Moon is in its Waning Crescent phase/ Balsamic Moon phase (a New Moon will occur on the 18th). Pluto came to a retrograde station last night. The temptation to borrow from your future is high today, Aries, or you could find that you’re overestimating something now with Mars, the ruler of your sign, in your finances and values sector in difficult aspect with Jupiter in your risk-taking, playful solar fifth house. Borrowing from your future is not only about money, although it certainly covers it, but can also include jumping into new situations without considering consequences and making promises or commitments that “future you” may not be able, or want, to keep. If the stakes are low, not much can be lost, except perhaps a bit of pride. If the stakes are high, wait for a day when your judgment and patience are in better form. You might also feel the need to defend your values today. A New Moon occurs in your sign tomorrow afternoon, so your best bet today is to concentrate on the things you want to improve in your life, particularly in terms of your personality, image, and attitudes. There can be a lot of revved up energy to deal with today, Taurus, with Mars in your sign pushing you to get things done and take on challenges. However, Jupiter is challenging Mars right now, and this can have the effect of making you feel that nothing is satisfying enough and leave you feeling restless, or it could convince you that you need to take on more than you can reasonably handle. Watch out for both scenarios, and create your own – find ways to release tension and to take action that have low stakes or that involve putting anger behind you. The Moon is Balsamic, so that even if you begin an exciting new venture now, not much is likely to come of it. People in your life, particularly a family member, could blow things out of proportion, so try to take things with a grain of salt. You could be feeling a bit of “spring fever” today, Gemini – restless and wanting to do something, but uncertain about where to channel your energy. There may be a difference of opinion that gets under your skin. Try to avoid alienating others in the process. The pace around you is hectic, or at least it might seem that way as there can be a lot of restless energy to deal with. Overdoing something with a partner can have frustrating results now. Impulsiveness can be strong, but this is the day before a New Moon, suggesting that new initiatives begun today are unlikely to take seed. This is an excellent day for keeping active, enjoying a new activity, or participating in something that you haven’t done in a while. You’re in a more daring mood emotionally, and sitting on that feeling might only lead to restlessness. However, don’t overextend yourself and avoid beginning brand-new important ventures, as your interests are likely to change tomorrow. Financial drains may become obvious today, Cancer, and since you are more willing than usual to face the truth, it’s a good time to put an end to it. Avoid impulsive acts, however. Impatience now can push you into a situation where you are over your head. Keep in mind as well that tomorrow’s New Moon brings a blast of in-charge energy when it comes to your career and reputation, and endeavors begun today are unlikely to take hold. Do not believe all that you hear today – exaggeration is pronounced, particularly involving a friend. A conflict with a friend is possible today, but can be averted. Avoid stubborn behavior. Entertain big ideas, but let go of anger – this is an excellent time to release those things you don’t want or no longer need with today’s Balsamic Moon. Try to catch your breath today on this day before a New Moon, dear Leo. Life is set to pick up pace considerably in the next few days, so take the time to center yourself now. This can be difficult nevertheless with energetic Mars square grandiose Jupiter in your sign. What you say and do today has more impact than usual, but your “delivery” may need some attention lest you come across as cocky or know-it-all. You probably don’t mean it, so be sure that others know where you’re coming from. Underlying tension and discomfort with the status quo can lead you towards impractical ventures, and can even cause you to make rash decisions. Take a deep breath, and wait until a better day to commit yourself to something important. Wind yourself down when you feel that you’re getting worked up over trivial matters. You may worry a little too much about what others are thinking or what they are believing, dear Virgo. Watch for over-reaching and overcommitting today, as you may feel able to do more than you actually can. Restlessness is a real possibility now, but also a sense that you may have too much on your plate or that you’ve planned poorly. Avoid making promises until you know you can fulfill them. A rebellious stance will not do you any good right now, so work on presenting a calmer, more centered “you”. Consider also that tomorrow’s New Moon is likely to take your mind away from current concerns and onto more empowering ones. There is a hot and cold energy going in with your close relationships right now, Libra, with Mars heating up your intimacy sector and Jupiter warming your friends sector. These two are clashing today, and you can swing between wanting to be especially close, to wanting to easily detach and be independent and accepting. Try your best to treat problems as stimulating challenges – there is a middle ground, and it would be in your best interests to find it. Tomorrow’s New Moon brings a more in-charge and naturally confident energy to your relationships. Today, try to take some of the pressure off, dear Scorpio, some of which you create for yourself, on this day before a New Moon. It may be difficult, however, as ego issues can emerge in your work or with significant people in your life. Avoid, if at all possible, promising action on something to a partner or employer just for the time being, as you tend to overestimate your ability to follow through on it. You could find that others are a tad pushy with you, and if you’re feeling infringed upon, avoid acquiescing and later feeling resentful. Set up clear boundaries, politely. You do not need to feel pushed into a corner. You may not be feeling one hundred percent in charge, but the New Moon tomorrow can change all that! There could be a bit of a race going on today when it comes to taking care of your daily duties and responsibilities or dealing with errands and tasks, Sagittarius. Tasks left unfinished have a way of demanding your attention today. Work through them one at a time instead of scattering your forces and spreading yourself too thin. Restlessness and impatience can interfere now. Try not to bulldoze your way through things. Impatience can subtly provoke others, so watch for that as well. It can certainly be difficult juggling two insistent needs (life experience and getting work done), but burning yourself out will not solve any problems. Major decisions and purchasing whims would be wisely ignored today, as interests and directions are likely to take a sharp turn after tomorrow’s New Moon. A tremendous urge to express yourself in a creative, unique manner can grab hold of you today, Capricorn, but how to go about it may not be as obvious, or you could meet with a less than warm reception. Watch for impulsive decisions and an overly competitive disposition. Romance, entertainment, and creative activities may have recently been big areas of drain on a financial level, and you could realize now that you need to rein things in. Romantic energy is strong today, although it can also be excessive. Instead of focusing too heavily on what you think things should be like, enjoy what you have. Avoid promising more than your capacities, and avoid believing promises made to you. They may be well-intentioned but could be made in the heat of the moment. Aim to determining the cause of this inner restlessness at a later date so that you can conduct yourself with greater awareness. 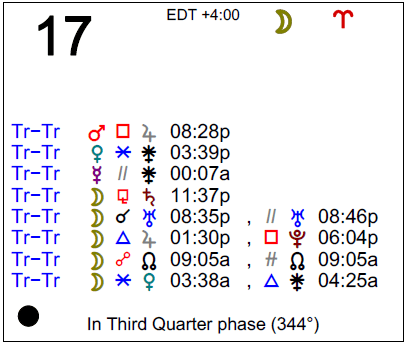 Clarity is not likely to come just now as the Moon is Balsamic, with a New Moon occurring tomorrow, and we are more likely to be symbolically in the dark. Even so, you’re standing out as especially capable today. Your home life may be especially busy or lively these days, and your attachment to the past quite animated, dear Aquarius. Be careful not to instigate conflicts, especially if you feel cooped up and restless. Take advantage of the extra energy you have now by pouring it into something constructive or physical (without overdoing it!). Take a detour from your usual routine just to keep emotional excitement levels high. Watch also for obstinacy when it comes to opinions. You may very well be “right” but sometimes it’s not worth the effort to prove it. You may be too focused on the way you think things should be, and too impatient for these things to materialize right now. Double check that you’re not shooting too high or expecting too much too soon, especially with regards to a partner or significant other. New directions are forthcoming with a New Moon occurring tomorrow. For now, concentrate on reviewing, reflecting, tying up loose ends, and letting go. Scheduling problems are possible now, as one part of you could be craving rest, and another part excited about taking on challenges. In fact, you may not be able to gauge the right amount of obligations or tasks to take on with ability and desire so mismatched. Mental energy runs high for you, but try to treat conversations as intellectual gymnastics now rather than taking things to heart. Engage in debates but keep some emotional detachment so that arguments are minimized. You may be filled with interesting and exciting ideas now, but you could be battling distractions and restlessness. Tomorrow’s New Moon brings a take-charge, empowering energy for taking care of your assets. Tomorrow’s energy is much more singular in focus than today’s. If Your Birthday is April 17th, If Today is Your Birthday full horoscope here. Relationships are mutually beneficial and naturally equal, fair, and balanced. There can be a stronger inclination towards togetherness and sharing. Sabian Symbol: A large disappointed audience. You can be thoughtful and imaginative, and sometimes a day-dreamer. You have an inability to trust and show your love for other people. This probably stems from childhood experiences with your parents. You may have felt unworthy of your parents’ love. Alternatively you may have perceived your parents’ as cold and unloving. As an adult you may become involved in relationships with an older person or someone who offers you financial or emotional security. You need to develop your own value system and develop compassion for yourself and other people. Sabian Symbol: A man handling baggage. Sabian Symbol: A bolshevik propagandist. Sabian Symbol: Shellfish groping and children playing. Cnj 09°Cn19 ALHENA To have a mission. Sun 03° Taurus 58' 06"
Moon 06° Capricorn 09' 24"
Mercury 09° Aries 39' 10"
Venus 04° Aries 33' 43"
Mars 15° Gemini 54' 22"